The world’s leading builder of performance yachts revealed today its plans to deliver a complete range of unrivaled cruising yachts ranging from 60 to 115 feet in length. The new cruising range, designed by naval architect German Frers together with Nautor’s design team, includes the Swan 60RS, Swan 80RS and Swan 105RS which will hit the water in 2014, plus the flagship Swan 115RS - the first of which will sail in 2015. Developed with needs of both blue water and long distance cruisers in mind, the models in the cruising range ensure short handed sailing with ease and are suited for long distances, with increased protection from the elements, additional stowage and tankage, with the option for shallow draft and lifting keels. 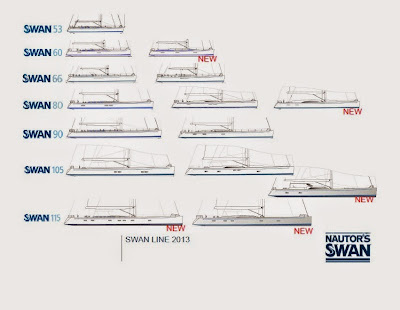 Nautor’s cruising range is taking advantage of the same hull design and construction techniques and materials of the successful performance range, and maintains the core DNA of a Swan with the utmost attention to quality, detail and style throughout. Nautor’s talented interior architects then work with owners to design and deliver interior layouts and attributes best suited to the client’s lifestyle and ambitions. Leveraging the expertise gained from close to half a century of building sailing yachts of the highest quality, as with all Swans, the cruising range will be built entirely by Nautor’s experienced craftsmen at the company’s headquarters in Finland.